The Aiwa Exos-9 is the closest thing to a boombox for the 21st century. You get big sound in a big package that you can take with you, since it sports a battery that lasts up to 9 hours. The Exos-9 is a decidedly niche product that will satisfy those looking for a speaker that can play loudly in and outdoors. However, its lack of current technologies like AirPlay, Google Cast, or a built-in voice assistant make it tough to recommend to those looking to create a multi-room audio system in the home. WIth the wireless speaker market crowded to the point of bursting by so many players, companies have to find a niche in order to be successful. Aiwa thinks there’s a niche for consumers looking for a large speaker that can play loudly in the home and on the go. The Aiwa Exos-9 is just that, and those looking for a speaker that can play loudly for a party indoors or out will be pleased by the speaker. However, if you're looking for a more modern speaker with features like AirPlay, Google Cast, voice assistants and Spotify built, you'll have to look somewhere else - the Aiwa Exos-9 is the modern equivalent of an old-school boombox. 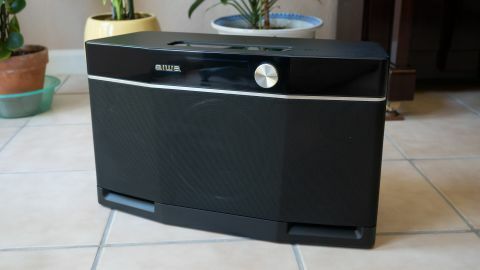 The Aiwa Exos-9 is a beast of a wireless speaker. The speaker weighs a whopping 13 lbs, which is honestly less than what we would have guessed by its 7.5 x 11.7 x 19.4 inch frame. There’s no getting around the fact that this speaker is unwieldy, so plan on hitting the gym if you want to take it with your summer BBQs and pool parties. While it certainly draws attention to itself, the design of the Exos-9 is generic and forgettable. The entire speaker is black with small silver accents like the aluminum volume knob. Its two tweeters, two mid-woofers and woofer are hidden behind a black grille. There’s also a LCD panel on the front of the speaker that displays the EQ you’re using as well as information like battery life and if the speaker is charging. On top you’ll find touch controls for play pause, a button to link two Exos-9 speakers together, and directional buttons used to select and tune the EQ on the speaker itself. Unfortunately, the buttons are all you've got - there is no smartphone app to control the speaker, which makes it feel positively ancient in an age where our wireless headphones receive regular firmware updates over Bluetooth. On the back, you’ll find the power switch, a 3.5mm analog-in jack, a USB-A port for charging your device, and a microUSB port for firmware updates. The back is also where you’ll find the 2,600 mAH 22V lithium-ion battery pack, which is rated to last 9 hours but there’s an option battery pack that doubles that number. The first thing you’ll notice about the Aiwa Exos-9's sound performance is that it gets incredibly loud. This speaker will have no problem filling the largest of rooms if your house with music. This makes it a great poolside companion or for a BBQ in the park where you need the extra power to pump your tunes loud and far. Overall, the sound signature is fairly balanced with the EQ turned off but you have the option to tweak the sound to your liking with a basic 5-band EQ. Bass offers incredible impact and extends deep, though it sounds a bit uncontrolled at loud volumes. Mids are well represented and highs never sound piercing. While the Exos-9 plays in stereo, its soundstage is quite narrow because the woofers are so close together. There are some speaker manufacturers that use digital signal processing (DSP) to make the sound wider, but there’s nothing like that going on with the Aiwa. Battery life is rated for 9 hours but we saw about 7 to 8 hours listening at medium volume. If you must have the speaker last all day, you can purchase multiple batteries to swap out or you can simply buy the $85 (about £64, AU$114) extended battery that doubles the Exos-9’s battery life. The Aiwa Exos-9 is a very good speaker for a very specific purpose. If all you want is a Bluetooth speaker that gets extremely loud and can be taken with you, then the Exos-9 is a great choice. However, it lacks modern features like AirPlay, Google Cast, and an integrated voice assistant, making i t less than ideal in the home. It’s also massive, lacks any water resistance, and takes forever to charge. For most, it’s hard to recommend the $300 (about £226, AU$403) Aiwa Exos-9 when that money can get you a Sonos One for the home and a JBL Flip 4 for taking your tunes on the go. Even the UE Blast with Alexa is a better compromise between home and outdoor use for $100 less. And for the same money, you can get the excellent sounding Marshall Kilburn, which gives you a sense of nostalgia with its physical knobs, switches and buttons. Sure, none of these will get as loud as the Exos-9, but you’ll have to really prioritize volume above all else with this speaker.